Your backyard BBQ needs this easy Grilled German Potato Salad with Sausage recipe. Easily doubled or tripled for groups. Plus it’s cooked in a foil packet for easy clean up! As the temperatures start to soar in the summer, the last thing we want to do is turn on the oven to make dinner. In fact, we use our grill to cook nearly everything this time of year, even our appetizers and desserts. (Why heat up the house if you don’t have to?) 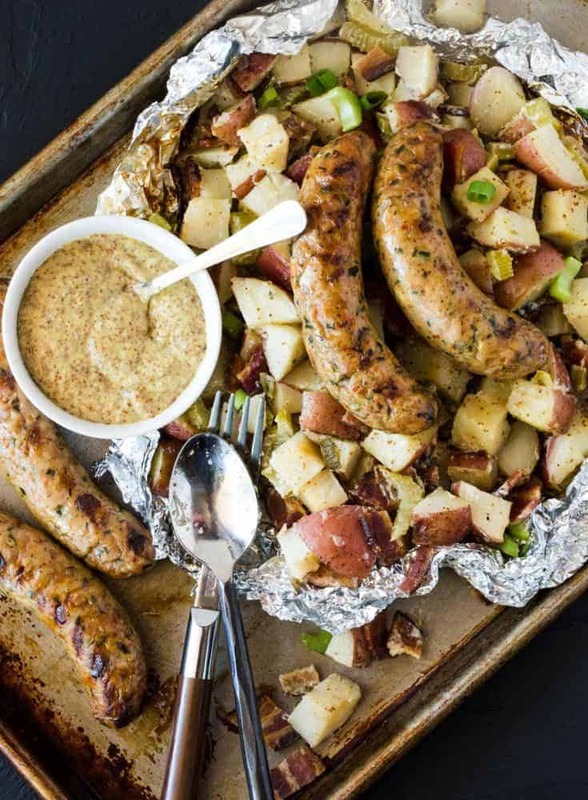 Today we’re sharing an easy new grilling recipe with you that is sure to be on repeat all summer long: Grilled German Potato Salad with Sausage. Potatoes and sausage go together like peanut butter and jelly; they are just made for each other. As part of our ongoing partnership with Gold’n Plump® (Yay for Minnesota-based brands! ), we’re so excited to create a recipe that pairs their flavorful Fully Cooked Chicken Sausages with a summer staple – potato salad. Have you tried Gold’n Plump’s Fully Cooked Sausages yet? If not, you definitely should. Available in five distinct flavors, including Jalapeno Cheddar, Italian Cheese & Peppers, Spinach & Asiago, Hickory Smoked Apple and Bacon Gouda, these sausages are protein-filled with less fat than pork sausages. Plus they are made with premium boneless skinless chicken thigh meat and are free of additives you find in other sausages, including MSG, preservatives, gluten and artificial flavors and colors. 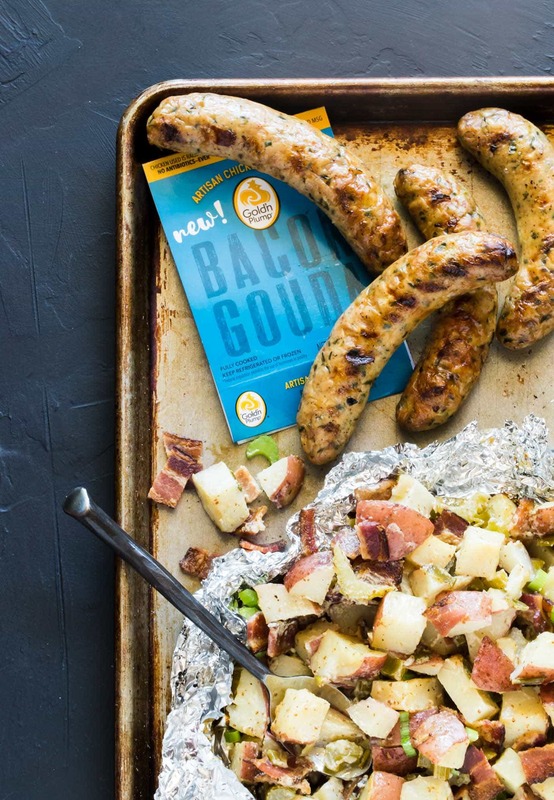 The Bacon Gouda sausages were the perfect choice to team up with our zesty Grilled German Potato Salad. Bite-sized potatoes are mixed with smoky bacon, celery and green onions and a zippy dressing made with coarse ground mustard, tangy vinegar and creamy mayonnaise. 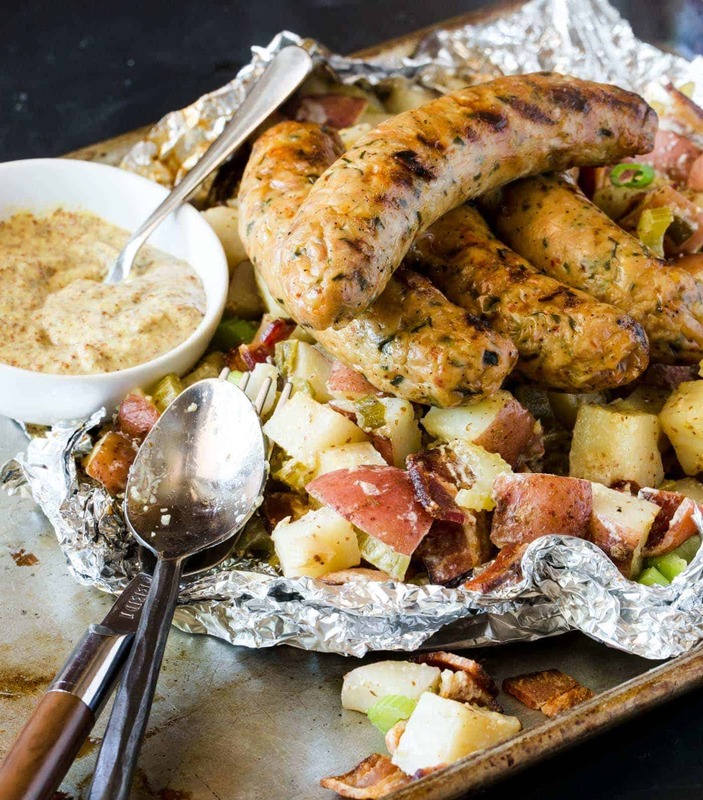 No need to heat up the house either, because after mixing everything together, this salad is placed in a foil packet and cooked through on the grill along with the sausages. Three cheers for easy clean up! Tip: Parboiling the potatoes in the microwave before adding them to the salad ensures they cook evenly and in less time on the grill. You can even parboil them the night before and keep them tightly sealed in the fridge if you are looking to save a few minutes on prep time later the next day. This Grilled German Potato Salad with Sausage recipe is great for entertaining, too. Simply double the recipe and serve it family style for your guests to take as much as they want. Or perhaps triple the recipe. One bite and you’ll know why it’s a keeper. You can find more recipes for all five flavors of Gold’n Plump’s Fully Cooked Sausages on their website or connect with them via social media including Facebook, Twitter and Pinterest. Disclosure: This post was sponsored by Gold’n Plump. All opinions are our own. Thanks for supporting the brands that make Garnish with Lemon possible. Place potatoes and 1/2 cup water in a large microwaveable bowl. Cover and cook for 10 minutes or until potatoes are just fork tender but not falling apart. Drain. In a large bowl, combine mayonnaise, vinegar, sugar and mustard. Season to taste with salt and pepper. Add potatoes, bacon, celery and onion and stir until evenly coated. Place two pieces of 18x24-inch heavy duty aluminum foil on top of each other. Pour potato mixture onto foil. Fold and seal foil edges together to form a packet. Grill for 35-40 minutes, turning every 10 minutes. During the last 10 minutes of grilling the potato salad, add sausages to the grill and warm according to package directions. Serve with potato salad.